Taste test: These very crunchy kettle cooked potato chips reminded us of Cape Cod chips, especially their salt and vinegar chips. However, these were a bit too salty with enough vinegar, so the lacked the correct balance between salt and vingear. 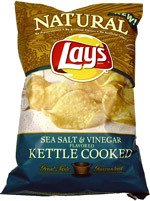 Still, these chips will satisfy you if you're a crunchy chip fan, and the overall taste was good. Smell test: Slight vinegar aroma.